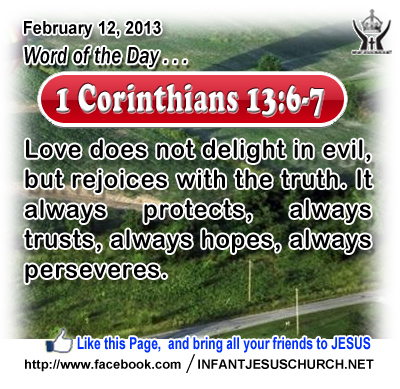 1 Corinthians 13:6-7: Love does not delight in evil, but rejoices with the truth. It always protects, always trusts, always hopes, always perseveres. Heavenly Father, we humble ourselves before you recognizing your boundless power to love, the incredible need for love in the lives of those around us, and our limited ability to love. Please pour your Holy Spirit into our heart and fill us with the power to love as you do, always. In Jesus' sweet name we pray. Amen. 1Now when the Pharisees gathered together to him, with some of the scribes, who had come from Jerusalem, 2they saw that some of his disciples ate with hands defiled, that is, unwashed. 3 (For the Pharisees, and all the Jews, do not eat unless they wash their hands, observing the tradition of the elders; 4and when they come from the market place, they do not eat unless they purify themselves; and there are many other traditions which they observe, the washing of cups and pots and vessels of bronze.) 5And the Pharisees and the scribes asked him, "Why do your disciples not live according to the tradition of the elders, but eat with hands defiled?" 6And he said to them, "Well did Isaiah prophesy of you hypocrites, as it is written, `This people honors me with their lips, but their heart is far from me; 7in vain do they worship me, teaching as doctrines the precepts of men.' 8You leave the commandment of God, and hold fast the tradition of men." 9And he said to them, "You have a fine way of rejecting the commandment of God, in order to keep your tradition! 10For Moses said, `Honor your father and your mother'; and, `He who speaks evil of father or mother, let him surely die'; 11but you say, `If a man tells his father or his mother, What you would have gained from me is Corban' (that is, given to God) — 12then you no longer permit him to do anything for his father or mother, 13thus making void the word of God through your tradition which you hand on. And many such things you do". Today’s Gospel we see Jesus accused them specifically of two things. 1St of hypocrisy. Like actors, who put on a show, they appear to obey God's word in their external practices while they inwardly harbor evil wishes and intentions. 2ndly he accused them of discarding God's word by substituting their own arguments and resourceful interpretations for what God requires. They listened to clever arguments before to God's word. Jesus refers them to the prophecy of Isaiah where the prophet accuses the people of his day for honoring God with their lips while their hearts went lost because of disobedience to God's laws. If we listen to God's word with faith and respect, it will both enlighten our mind and clean our heart – thus enabling us to better understand how he wants us to love and obey him. The Lord invites us to draw near to him and to feast at his feast table. Do we approach with a clean heart and mind? Ask the Lord to cleanse and renew you with the purifying fire of his Holy Spirit. Loving Infant Jesus let the fire of your Holy Spirit cleanse our mind and heart that we may love you purely and serve you worthily.